ABC News asked BuzzFeed Food editors to come up with nine original recipes for food mashups, then debut them on air over the course of three days, and let viewers pick the best. Aug 2014. Trend segment about models with cookbooks, food blog, and cooking videos. Jan 2014. Appeared as a judge alongside chefs Wylie Dufresne and Charlie Palmer. Aug 2014. 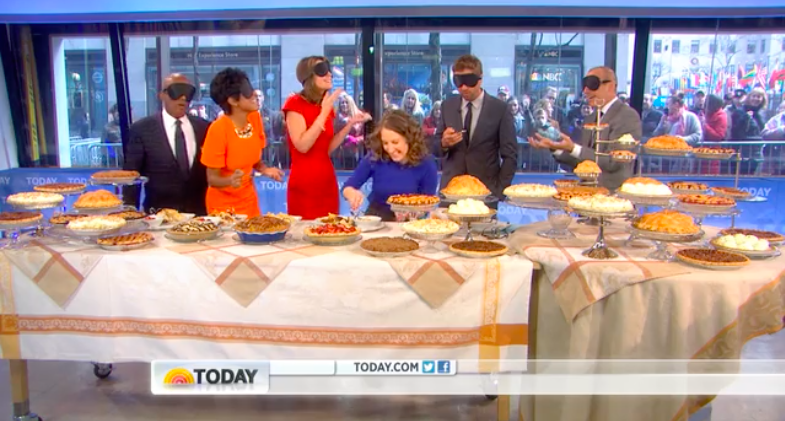 To celebrate Pi Day, I created three "wacky" pie flavors at the TODAY show's request and helped the anchors and actor Gerard Butler taste-test the pies blindfolded. Along with three other BuzzFeed editors I built a giant Snack Stadium (ie, piles of Super Bowl food in the shape of a stadium) on live TV. Jan 2014. Quick cooking demo of Thanksgiving leftovers. Nov 2014. Tasting foods on air featured in a post on the most delicious wintertime foods in NYC. Feb 2014.